In his show, ‘The Alchemist’s Garden: an Anti-Modern Laboratory’, Alessandro Michele remixed vintage references with a geeky, granny and decorative style. 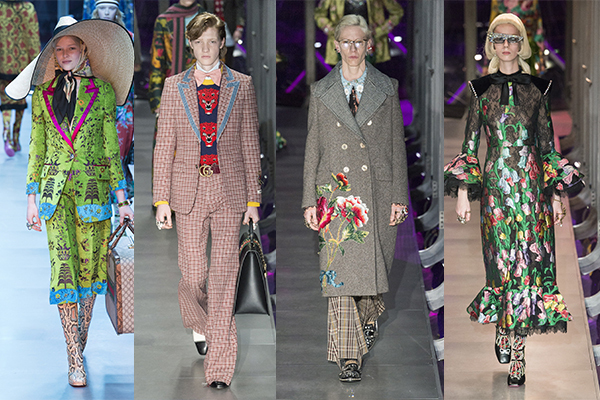 Gucci’s first co-ed show featured over 120 people, and each look was individual and purely unconventional. 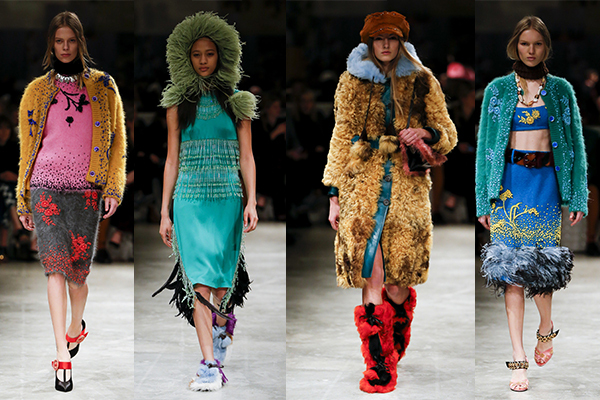 Moving away from last season’s lions and snakes, this time it was the Oriental sentiment that took centre stage. Japanese sun parasols were graffitied and UFOs were printed on silk dresses and kimonos. There were tiered floral dresses, snakeskin fitted boots, floral hosiery and leather biker gilets covered in tiny gold butterflies, foxes and beetles. But it was the playful use of logos, Renaissance-inspired rings and fierce juxtaposition of fabric and tone that added a rare sense of dynamism. Jeremy Scott’s concept for Moschino combined fearless fashion with art, music and politics. Making a case against fashion’s unsustainable nature, Scott covered the runway with cardboard which was held together by parcel tape. His wardrobe included a carton-like skirt suit (worn by Kendall Jenner), a full-length gown worn with a cellophane wrapping of a dry clean service, and a dress made out of lost-and-found watches (worn by Bella Hadid). The ample number of collage printed pieces and bubble wrap frocks were a nod to Scott’s ideology: ‘Couture is an attitude’. Miuccia Prada moved away from her high-art references to basic inspirations like trinkets, shells, and motifs that can be found in the nooks and corners of one’s homes. She described her current sentiment of ‘going from bigness to smallness’, and it was clearly evident in the chocolate covered corduroy suits, shaggy and snakeskin belted coats, Mongolian boots and dramatic swingy skirts. An ode to the Seventies, it was the ostrich feathered helmets and bejewelled cardigans that added drama to the little things. Redefining power dressing, Alessandro Dell’Acqua AW17 show for his Milanese brand, No.21 was all about redefining power dressing. It was also an Italian take on Americana, cleverly reflected through varsity-inspired suit jackets, classic Hollywood dresses, and re-imagination of the Letterman jacket. Furry, bold, brave and bejewelled… there was something for everyone, especially the woman governed by her individual fashion reality. There were pencil skirts, knee-length dresses, fur jackets worn over brocade skirts, and the Instagram-approved T-bar heeled sandals in colourful satin. Vintage Hollywood, film noir, Thirties glamour were the sentiments aroused at Tomas Maier’s show for Bottega Veneta. The very feminine collection was given a hint of masculinity with sharp cinched waists and strongly structured shoulders. Dresses with sweetheart necklines were sprinkled with belts and exciting hardware. Smartly tailored skirts, dresses in pale blue, mustard, peach and jet black were as retro as they were futuristic. While the silhouette for winter seemed to be getting slimmer, coats were seen in varying forms. 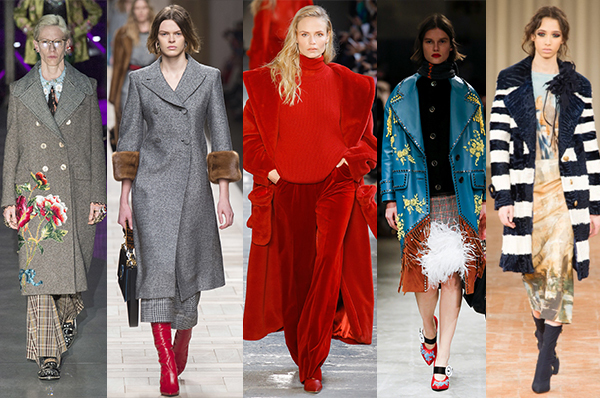 From Max Mara’s super comfortable overcoat to Fendi’s leaner versions — some cinched at the waist and some in fiery red. Armani’s showcased its double breasted version, Prada made optimum use of suede and corduroy while, Gucci played with their signature embroidery. Knitwear made a striking comeback at Alberta Ferretti, No 21 and Emporio Armani. 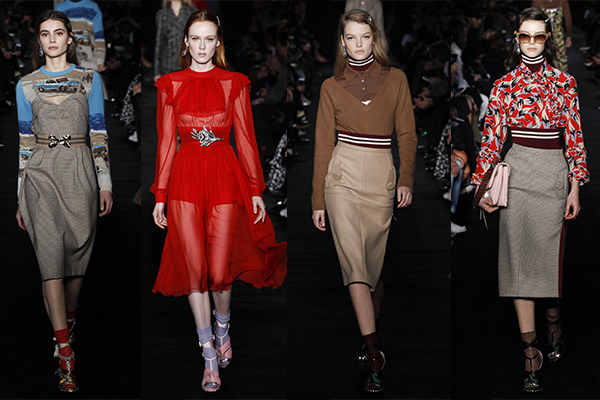 Ferretti showcased jumpers and coats, classic crew-neck versions over long flowing skirts. 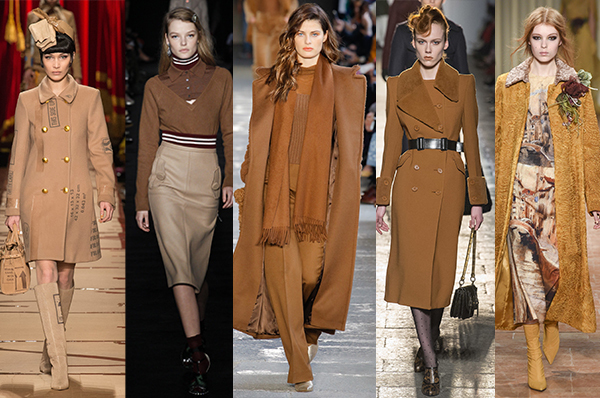 Max Mara’s desert-hued wardrobe also featured ribbed sweaters and luxuriously-tailored hoodies. 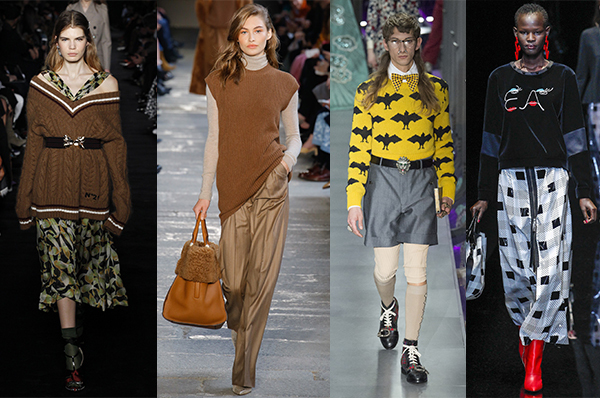 Chestnut, camel, and coffee hues dominated the runways. Max Mara’s collection revolved around a Scandinavian-inspired backdrop featuring soft suede, shearling and fur, all in shades of brown. 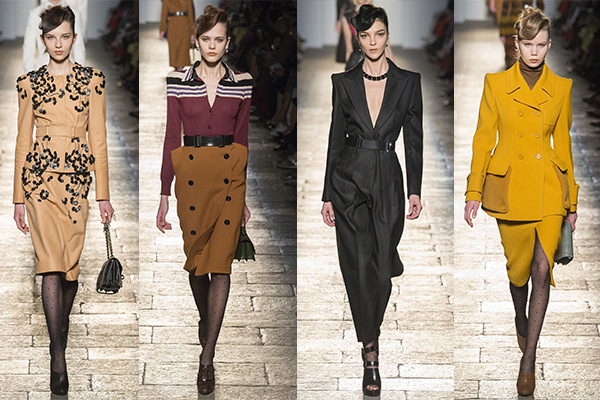 The earthy shade was seen in varying degrees at Moschino, Gucci and Fendi.